The Death-Match is under new management. The Hunt Master's Champion has been installed. All regular players are welcomed back to the Pursuit Lounge to observe the contest in luxurious surroundings. Privacy is assured. For this reason we ask our elite guests to abide by the strict security protocals. Please note, the house has no limits. In the Gallery, your combatants can be observed on the orbiting Quarry Station. A purpose-built environment filled with deadly traps and hidden dangers. Prizes are offered for every kill, with bonuses for rogue elements. Only an elite hunter can survive the End-Game. Do you have a worthy champion? 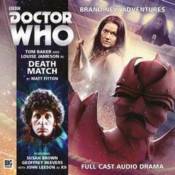 Kill or be killed: the only rule of the Death Match...The fourth series in a Big Finish range which is hugely popular with fans of the classic TV series Doctor Who. The Doctor's enemy The Master (played here by Geoffrey Beevers) was first introduced in 1971. As well as Doctor Who, Louise Jameson has been seen in Bergerac, Eastenders, and many other UK shows. CAST: Tom Baker (The Doctor), Louise Jameson(Leela), John Leeson(K9), Geoffrey Beevers (The Master), Susan Brown (Kastrella), Andy Secombe (Vargrave).